On August 19, 2017, a mysterious blot appeared in Monterey, California. Emerging during the annual migration of hundreds of million-dollar cars to the Monterey Peninsula, the blot threatened to attract riffraff bringing unwashed cars (gasp!) to the area. They probably wouldn’t even have table linen and crystal for their champagne lunches! But despite the lack of these usual Monterey amenities, the blot, otherwise known as the 2017 California Concours d’Lemons, had a show field of 150 cars and drew over 5,000 spectators to view some of the worst cars in America and see shameless celebrity judges pick out the worst of the worst. If you know anything at all about cars or car shows and haven’t been living on the moon for several years, you know that Monterey Car Week has been promoted as the Holy Grail for car lovers. Just about any car activity you can think of is at Monterey – vintage racing, general car shows, specific marque car shows, shows for cars from specific countries, auctions, and fine arts exhibits. This year, the festivities started on August 12 and concluded on August 20 – which, if you’re paying attention, is a span of nine days. Perhaps a “car week” is different from a “calendar week,” but the fact is Monterey Car Week has expanded to the point where it cannot be conducted in just seven days. There comes a point at which upscale car shows all become alike. They all have official judges wearing blue blazers and snappy straw hats, walking the show grounds looking at very expensive cars trying their best to find specks of dust here and there, and young ladies in flowing summer dresses and big, floppy hats gliding along a red carpet to deliver trophies to contestants in the winner’s circle. If you love cars, have a good sense of humor and are tired of the same old uppity car show schtick, remember this name – Concours d’Lemons. You have to love any organization, and we’re using the term very loosely here, that advertises itself as “celebrating the oddball, the mundane, and the truly awful of the automotive world.” Concours d’Lemons is the love child of the fertile minds of Jay Lamm and Alan Galbraith. Jay was one of, if not the, prime instigator of the 24 Hours of LeMons, an endurance racing series for $500 cars (seriously) that has been wildly successful. Starting at a few race tracks in California, the series for 2018 will include nineteen races across the United States, four in Australia, and three in New Zealand. Alan was promoting the Billetproof series of Hot Rod and Custom Car shows when he and few friends entered the 24 Hours of LeMons series. Alan and friends spent a lot of time in the pits being reprimanded by Jay for their lousy driving and, of course, they became close friends. At a post-race meeting, over a few beverages, Alan mentioned to Jay, “You ruined car racing with this LeMons thing, let’s do the same to the car show world.” And the rest, as they say, is history. It started with one event in California, and now there are four Concours d’Lemons in the United States, and one in Australia. 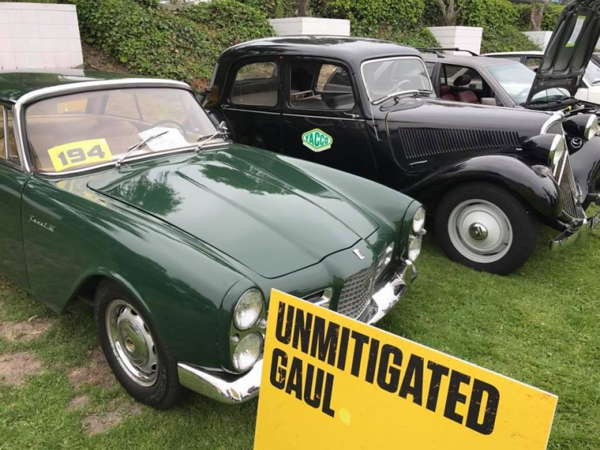 Monterey Car Week seems to be the ideal place for a Concours d’Lemons show as it is the perfect counterpoint to the numerous events for very expensive automobiles, or “motor cars,” as they are sometimes referred to by the more pedantic owners. And besides, there is no competition to the Concours d’Lemons anywhere on the Monterey Peninsula during Car Week – you just won’t see these kinds of vehicles displayed anyplace else. A good indication of the types of cars that appear at Concours d’Lemons can be gleaned from their judging categories, which include: Rust Belt American Junk categories for GM, Ford, Chrysler, and Others; Rueful Britannia for British cars; Needlessly Complex Italian for, of course, Italian cars; and Unmitigated Gaul for those who like cars of the French persuasion. This year featured two special classes, the Cos-worthless Vega Class for Chevrolet Cosworth Vegas and the Munoz Class-less Class for Muntz Jets. But the award that every owner is shooting for is the Worst of Show, truly representing the worst of the worst. 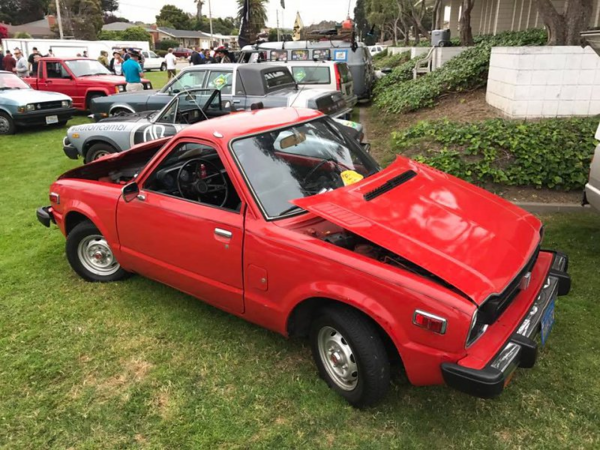 This year’s Worst of Show award was given to what can best be described as the automotive equivalent of Doctor Doolittle’s Pushmi-Pullyu character, comprising two Honda Civic front halves, each with its own drivetrain, steering wheel and driver seat, welded together. The fine automotive hardware attracted by the Concours d’Lemons demands the best in judging talent, and Monterey was no exception. Judges included NASCAR commentator Mike Joy, Amelia Island Concours founder Bill Warner, and classic car tire magnate, Corky Coker. It is truly mind-boggling that experts with perfectly good jobs would risk sullying their reputations by appearing at a Concours d’Lemons event without some sort of disguise. This craziness also now extends into sponsor’s boardrooms, with otherwise upstanding businesses like Hagerty and Grassroots Motorsports ponying up untold sums to be represented at Concours d’Lemons events. We’d like to extend a big TireBuyer ‘Thank You’ to Alan Galbraith, the self-proclaimed “Head Gasket” of the Concours d’Lemons shows, for his help preparing this article and for allowing us to use some of the “Official” event photos taken by Randy Carlson. 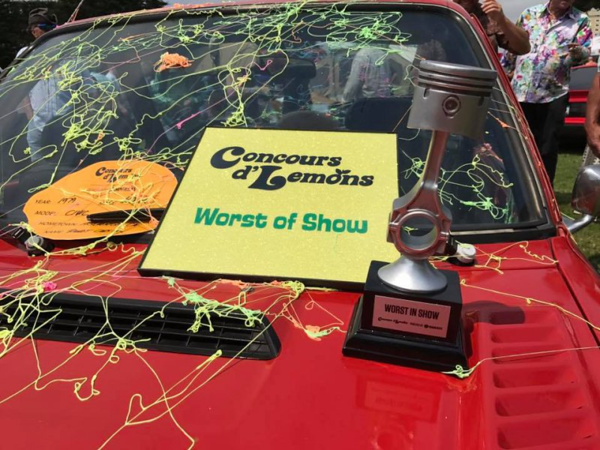 For a complete list of show winners, see the Concours d’Lemons website and for the schedule of all upcoming Lemons events, please visit the 24 Hours of LeMons site.